Heritage Academy is proud to continue the implementation of our student 1-to-1 technology program. For the 2018-2019 school year, our 9th-12th grade students will be required to bring their own Apple iPad to school each day. Students in 7th-8th grade are encouraged to bring their own iPad to school each day, but it is not required for the 2018-2019 school year. An iPad environment in the classroom makes thousands of high-quality educational apps available at our student’s fingertips. Implementing the iPad into Heritage’s daily curriculum, allows the student to engage in learning like never before. Students will be required to enroll their devices with the HA network before their device can be used at school. This will enable students to connect to the school’s Wi-Fi and receive school-wide apps. More information about this enrollment process will be available at the beginning of the school year. The iPad must be Wi-Fi only (meaning no 3G/4G data service attached to the device). The iPad must be updated to the newest iOS update available from Apple. There is no storage requirements for student iPads, but the student must maintain a reasonable amount of unused storage on the device in order to be able to download and install apps and create/save projects and assignments as required. 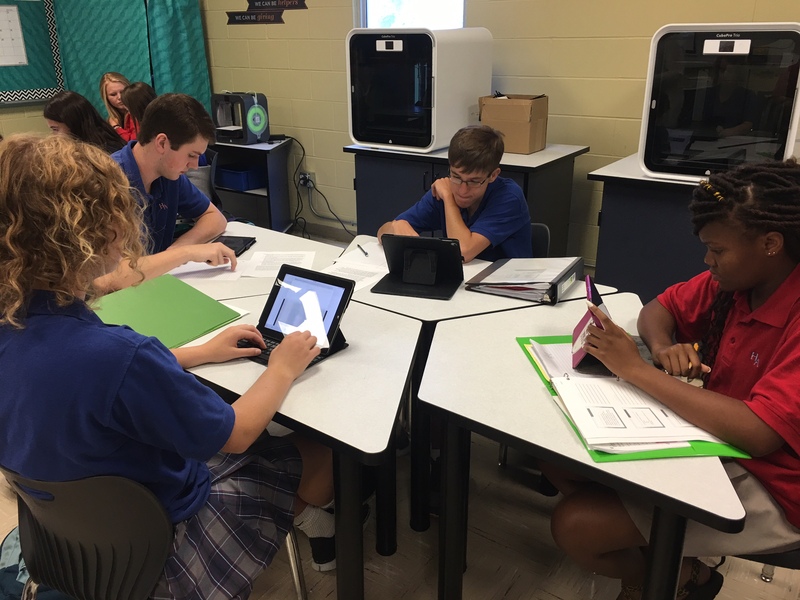 - iPads will allow students to engage in their daily curriculum by utilizing thousands of educational apps at their fingertips. - 9th-12th grade students will be required to bring their own iPad to school each day for daily classroom use. 7th-8th are encouraged to bring their own iPad to school each day for classroom use, but it is not required for the 2018-2019 school year. - Device must be an Apple iPad that meets the requirements listed above. Q1. Is my student required to have their own iPad? A1. Yes, if your student will be in the 9th-12th grade for the 2018-2019 school year, they are required to own their own iPad and bring it to school each day. Students in 7th-8th are encouraged to bring their own iPad to school each day, but it is not required for the 2018-2019 school year. Q2. Why iPads instead of Macbooks/laptops? A2. After much research, we believe that using an iPad in the classroom will enhance the student’s educational experience. Thousands of high-quality educational apps are available for the iPad. The iPad is more affordable, more intuitive, more portable, and requires less maintenance than a laptop. Q3. Why isn’t the school providing the iPad like the MacBooks? A3. We believe that a student-owned device will increase the sense of ownership and pride in each device and allow the student to customize the device to help meet their specific educational goals. Also, students will be able to keep the devices over the summer, unlike the MacBooks. Q4. Which iPad should I purchase? A4. Heritage Academy recommends purchasing the newest available iPad, directly from an Apple Store, authorized Apple reseller (like Best Buy or Walmart), or from the Apple Online Store. Most students tend to like the 9.7" versions, but any size is allowed. Q5. Will my student be required to purchase apps for classroom use? A5. Possibly. Each teacher will decide what apps are needed for his or her class. It is recommended to set up your student’s Apple account with a gift card, to avoid charges to a credit/debit card. Q6. What if my student makes unauthorized app purchases using my credit/debit card? A6. We recommend setting up your student’s Apple account with an Apple gift card. This way student’s are limited in what they can purchase. Heritage Academy is not responsible for any charges incurred by a student on their iPad or with their Apple ID. Q7. What are the rules my student will be expected to follow under this new program? A7. The student will be required to agree to the Heritage Academy Personally Owned iPad Agreement and the Technology Responsible Use Agreement. These documents will explain the rules and expectations for participating in this program. Q8. What does my student need to do with the iPad before using it at school? A8. Student will be required to enroll their devices with the Technology Department before they can use them at school. More information about this process will be available at the beginning of the school year. Q9. What happens if my student runs up data network charges while using the device at school? A9. Student iPads are required to maintain a connection to Heritage Wi-Fi while at school. Use of cellular data (3G/4G) is strictly prohibited. Heritage Academy is not responsible for any charges incurred by cellular data usage. Q10. Can I contact my student using the iPad during school hours? A10. No, contacting a student during school hours can be intrusive on the learning environment. If you need to contact your student, please call the office at (662)327-5272. Q11. What if my student’s iPad is damaged or stolen? Q12. What if the iPad’s battery dies? A12. It is the responsibility of the student to bring their iPad to school each day charged. Charging stations will not be provided. Not having a usable iPad in class each day can result in the inability to participate in classroom instruction. Q13. What if my student forgets their device at home? Will the school provide Loaner iPads? A13. The school may have a very limited amount of Loaner iPads. Bringing the iPad to school each day is the student’s responsibility. Not having a usable iPad in class each day can result in the inability to participate in classroom instruction. Q14. What if my student loses their iPad? Q15. Will my student be able to take pictures or videos with the iPad? A15. Taking pictures and recording video can only be done under direct teacher supervision. Taking pictures/video without direct teacher instruction can result in disciplinary action. Q16. Can the school temporarily confiscate/search my student’s device? A16. Yes, before bringing the device on campus, the student and parents must sign and agree to the Heritage Academy Personally Owned iPad Agreement and Technology Responsible Use Agreement.